plus Images, Animated GIFs and Webcams as your screensaver. - sports, news, webcams and more. Corporate Send images and text bulletins to your employees screens, and update them remotely at any time. Display HTML pages from your Intranet or link to any page via the Internet. - Includes password protection and advanced administrative functions. - User settings and display list can be updated at any time remotely. Register your copy now for only $19.95. Remotely manage information on your employees' desktop. Make updates at any time. Use the Auto Web View Screensaver to cycle through a list of your favorite informational websites, plus Images, Animated GIFs and Webcams - and display them as your screensaver. View the latest news, sports, stocks, weather, entertainment and more. Update the web page views as often as you like. Includes a scrolling text caption to display the current date and time, and a personalized message. Link directly to the current web page being displayed by pressing the "spacebar" on your keyboard - get more information about the news item that you are reading. Unlimited Number of Content Screens: Create a list of your favorite web pages, images, animated GIFs, or videos, and automatically cycle through them for display. Remote updating of Settings and Display List: Create a remote configuration file containing all of the screensaver settings including the display list and save it on your corporate web server. Update the information that your employees see at any time, simply by replacing the file. Advanced Administrative Functions: Password protect screensaver settings or limit the configuration program to Administrators. Automatic Page Scrolling: Allows you to view the entire page without touching a single key. Scrolling Marquee: Display a text caption with each image. Options include: webpage/image name, the current date and time, time elapsed since the screen saver started, or a personal message in any font and color you choose. Display Auto Web View content as your regular screensaver. Can also be set to run when no user is logged onto the system. SPACEBAR: Link directly to the current web page by pressing the "spacebar". Press "TAB": To advance to the next webpage in your list. Press "Backspace": To advance to the previous webpage. Press "F12": To refresh the view of the current webpage. Use the arrow keys: To Scroll the current page. Drag-and-Drop support: quickly add new items to the Display List. Group Policy Management: Active Directory users can fully manage the screensaver using Group Policy (GPO). An Administrative Template (Auto Web View.adm) that can read into your group policy editor is included. Error detection: Display a default HTML page of your choice in the event of an error accessing the Internet or your corporate server. Integrated Help File: Includes detailed information on all of the screensaver settings and features. Use a custom version of the Auto Web View Screensaver to display a list of webpages, images and animated GIFs on the screens of your employees or customers. Provide the latest up-to-date information simply by linking to Intranet content that you already have, or link to any Internet HTML pages. on our other custom corporate screensavers. 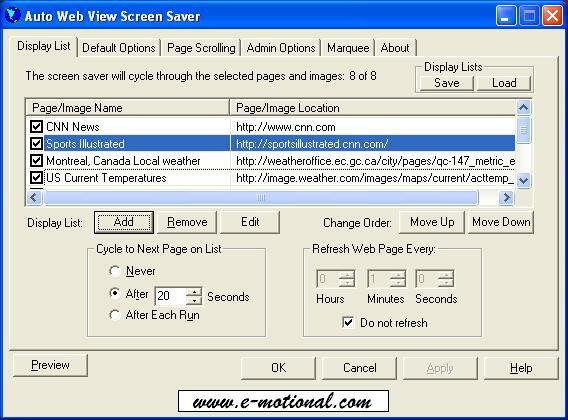 The following images illustrate some of the configuration options and potential uses of the Auto Web View Screensaver. Click on an image to view in actual size. 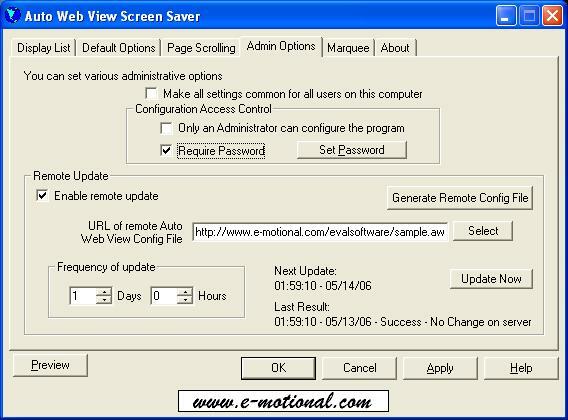 Obtain a free 7-day evaluation version of the Auto Web View Screensaver: click on Download. Copyright © 2002-2018 Esm Software. All Rights Reserved.